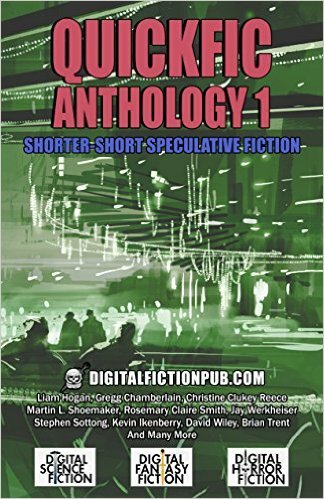 Hey, my zombie story is in a new 99 cent anthology of 44 short-shorts. These short-shorts (no, not the ones women wear) are just the thing to read while standing in line or sitting in a waiting room or taking public transportation. Hope you’ll try ’em on … er … give them a read. The folks who put out the Quickfic 1 Anthology stuffed it with terrific SF, fantasy, and horror. When I first started publishing short fiction, I found it frustrating that so much of the writing advice out there was geared toward novelists. This still seems to be true, although nowadays, advice for fiction writers is apt to focus on publicizing their work as much as creating it, or even more so. What’s a writer of short stories, novelettes and novellas to do to help those who’ve read a few of their shorter works find more of them? Well, one answer-by no means the only one-is to set up an Author Page on Amazon.com. You can set up your free Author Page in under an hour, usually in considerably less time than that if you are at all technologically savvy. Here’s how. First, search on Amazon.com for your name and whatever pseudonyms you’ve used. Amazon should spit out a list of magazines, anthologies, collections, singles, and other publications in which your work has appeared. You will want to make sure that it’s complete, particularly as to stories that may be a few years old. If items are missing, it’s pretty easy to fill out the form to alert Amazon to what needs to be added. In fact, when I’ve done so, they made my requested additions overnight. Also, don’t be surprised if your search turns up some items that aren’t yours. Given that this blog post is all about publicity, here’s my Amazon author’s page. I hope you’ll click on my Follow button. Thanks! Though I do have a system for fiction reading, I can never come close to reading all the books I want to, or intend to, in any given year. My system in 2014 was to focus on quite recent titles, and to read everything (or close to it) that was nominated for the Nebula or Hugo awards. While I mainly read novels, I find that they get a disproportionate share of attention by many readers. More’s the pity, as short stories are a great way to find new writers you’ll love, and to enjoy some wonderful works that cannot be sustained at novel length. So, without more ado, here are some books that really stood out for me this past year. The Martian – Andy Weir – It’s a tale of the competent man as a fully developed protagonist in a battle to survive alone on Mars. Ancillary Justice – Anne Leckie – There are so many reasons this first novel has taken the major awards. The Red: First Light – Linda Nagata – Military science fiction has to have a lot going for it to hold my interest, and this one does. Hard Wired – Walter Jon Williams – For contrast, I re-read this cyberpunk classic to find that it’s still fresh, gritty, and gripping today. American Craftsman – Tom Doyle – Here’s a modern-day military thriller/fantasy mash-up of interest to readers of Poe, Hawthorne, and Lovecraft. The Golden City – Kathleen Cheney – This is a thoroughly enjoyable detective story set in turn-of-the-century Porto, featuring selkies and other sea people. The Golem and the Jinni – Helen Wecker – I loved the people and the setting in turn-of-the-century NYC, which is where my mother’s parents met and married. Hild – Nicola Griffith – This portrayal of life, religion, and intrigue in 7th Century Britain gives us a wonderful look at just how different it must have been to live in a pre-industrial society lacking much of the knowledge of science that we take for granted. Shambling Guide to New York City – Mur Lafferty – What’s not to love about a travel guide for vampires, zombies, water sprites, and the like? Her Husband’s Hands and Other Stories – Adam-Troy Castro – These are dark, even disturbing stories, not something to breeze through merrily. Best of Kage Baker – The author was a remarkably gifted story teller who passed away too young. The Year’s Best Science Fiction 29th, 30th, and 31st Annual Collections – Gardner Dozois – I’d somehow fallen behind in reading these annual anthologies of short fiction by many of the best writers in the field. Year’s Best SF 18 – David G. Hartwell – Another great assemblage of science fiction, some of which overlaps Gardner’s, by another masterful editor. Catfish and Mandela — Andrew X. Pham. Most of the non-fiction I read is for my own research. However, I was so taken by this part-biography, part-travel-tale written by a Vietnamese immigrant to the U.S., that I simply had to include it. Lastly, I present you with some gender stats: The books I’ve read in 2014 (all of them, not just my favorites) are almost evenly split between male and female authors, with just one more male author than female author. While I love to read authors I’ve never tried before, I don’t systematically try to balance the number or percentage of books I read that are written by women as opposed to men. In picking out my 2014 favorite books, I only gave thought to author genders after I’d finished my list. Hence I find it interesting, and reflective of nothing other than my own personal taste, to see that my favorites this year in SF are split 50-50, and 60-40 for fantasy. My dark fantasy favorite books this year are both by women, while the single-author collections divide equally. Maybe I do have a slight preference for women authors, as the list above has 6 men and 8 women for single-author works. Having said all that, I have to conclude that a list of 14 favorite books (excluding the 4 anthologies) isn’t a large enough sample to draw any meaningful conclusions.